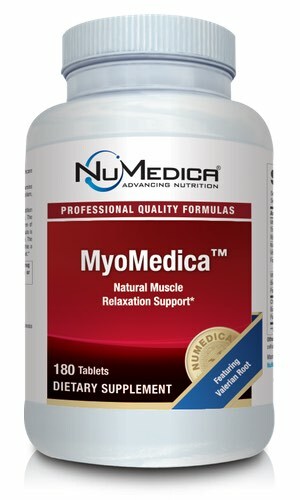 Available in easy-to-swallow tablet form, MyoMedica-60t is formulated with collaborative blend of powerfully beneficial nutrients designed to support muscle relaxation, muscle function and may help relieve minor muscle discomfort and cramping. 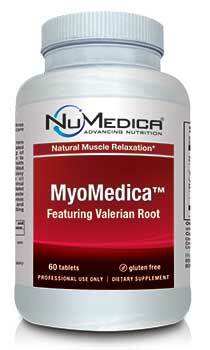 One of the primary ingredients in MyoMedica-60t is Valerian Root, a naturally effective botanical offering the antioxidant health benefits of alkaloids, GABA and flavanones. In research studies, Valerian Root has been found to help people fall asleep faster and enjoy improved quality of sleep. MyoMedica-60t also contains rich amounts of vitamin B-6, a nutrient necessary to produce two important neurotransmitters--norepinephrine and serotonin--that may additionally encourage relaxation and well-being. Vitamin B6 further promotes cell functioning by supporting chemical reactions within cells crucial to cell health and overall functioning of all physiological systems. Additionally, a fatty substance important to nerve strength called myelin requires B6 for its development. Myelin may aid in restoring damaged nerves and improving cognitive functioning. Other Ingredients: Dicalcium phosphate, MCC (microcrystalline cellulose), croscarmellose sodium, stearic acid.